Pier Pool on a summer day. For all of our swimmers and non-swimmers as well, mark this Saturday morning, June 11th, to go by Pier Pool and register for a week of free swim lessons or to purchase your family summer swim pass. The pool office will be open from 8:00 – 11:30 am for swim lesson registrations that begin Tuesday, June 14th. 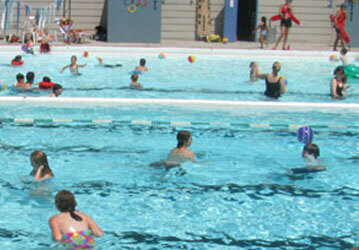 The free swim lessons are a short session ending on Friday, June 17th. For special events, including Safety Splash Day and Dive In Movie, please see our Events page.